The kids are still with us until early next week, so while the project is in full swing, we’re still a bit constrained in terms of what we can practically do. So it was with great curiosity and some trepidation that we started pulling up the old vinyl in the now-empty pantry last night. We found a subfloor edge we were able to get a pry bar under, and with some effort got a small piece of plywood up and out of the way. Under the staples, as we more-or-less expected, was another floor. Rather than sheet vinyl, this floor is individual adhesive-backed vinyl squares, and beneath that it looks like some earlier floor, though it’s hard to tell, as the adhesive between these two layers is stronger than that which holds the whole mess to the underlying hardwood. That’s right — under a mere 4 layers of other junk is the same hardwood floor that we have in the rest of the first level of our house. I guess that wasn’t really surprising — there had to be something there, and when the house was built ~100 years ago that would’ve been the only choice. Anyway, the bottom two layers of floor came up without too much trouble. 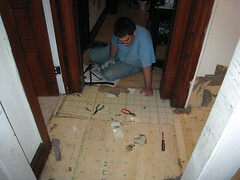 And with pliers and a lot of elbow grease we got the staples out of about a square foot of floor. In only half an hour. With two of us. 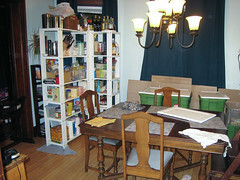 Sooo, let’s see … about 270 square feet of floor, so just OH MY GOD THAT WILL TAKE WAY TOO LONG hours of staple pulling. Blindly confident that we’d figure something out, we let that mark the end of Spring Break eve. We got home and tried out the new toys, and things are night-and-day better. 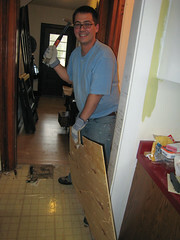 I cruised through about 15 square feet in just over an hour, and we also spent some time scraping the old underlayment and adhesive off of the old hardwood, just to test. So basically, what was a big high-risk mystery just 24 hours ago is now a relatively known quantity. 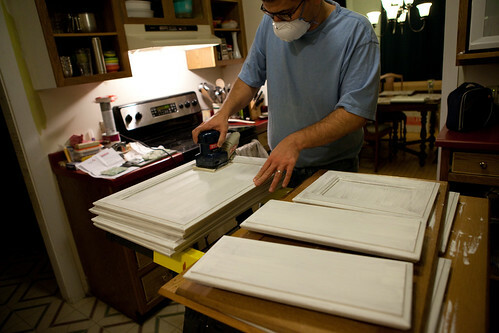 In far less dramatic news, I’ve nearly done painting the cabinet doors, and primed our prototype cabinet interior today. We’ve reduced the kitchen to a very small shell of its normal functionality, so we’re now able to sand and paint more or less at will. The pieces that are finished look good, there’s just a lot of surface area left to cover. After the kids went to bed, we hung plastic sheeting around the stairs and Amy started sanding. Between the walls of plastic and the masks the house looks like a scene from Dexter (I wonder if the dinner delivery guy noticed!). We decided today to listen to a new album each day. 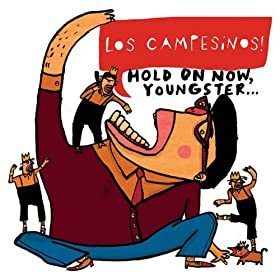 Today’s choice (from Amazon’s $5 MP3 album bin) was Los Campesinos!‘s Hold on Now, Youngster. We both thought it was OK after an initial listen. Ha! I’ve written a small book. If Amy doesn’t kick me off of her blog for writing absurdly long posts, there will be more tomorrow.